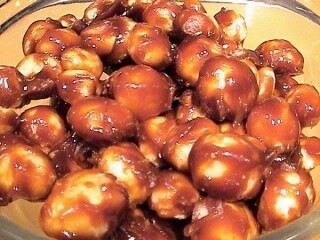 Its not necessary to use expensive Kona coffee when cloning these awesome glazed macadamia nuts from Mauna Loa. Since the coffee is combined with butter, sugar, and other ingredients, no one will know the difference. But you will have to make your coffee very strong. Use twice the grounds recommended by your coffee maker or use espresso for this recipe. you'll also need a candy thermometer since you'll need to bring the candy to precisely 290 degrees F before stirring in the nuts. Make sure to heat up the nuts in a separate pan so theyll be hot when you add them to the candy. This way the candy doesnt cool too quickly and the nuts get a nice thin coating of the goodness. The candy coating wont be as thin as on the original nuts, but its a pretty good copy considering your home kitchen probably doesnt come equipped with one of the commercial candy tumblers or enrobers you find on the production line in the Mauna Loa manufacturing plant.